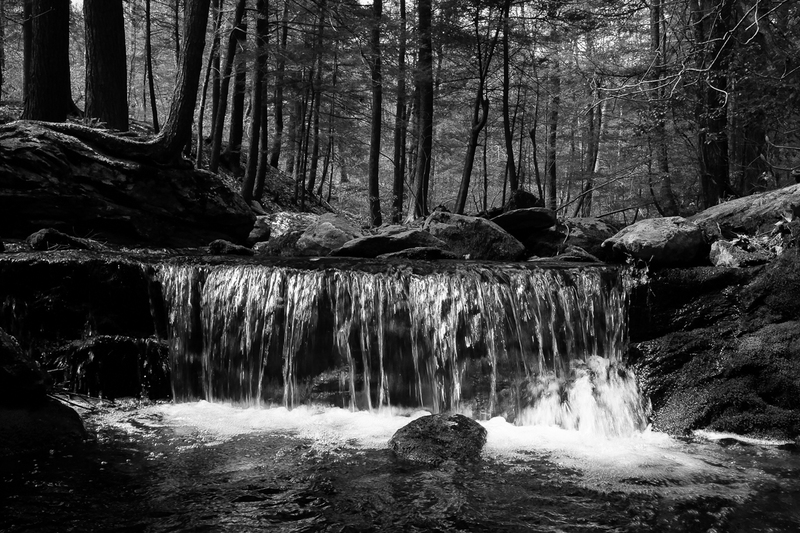 This is a small waterfall on Race Brook with the large waterfall (Race Brook Falls) behind me. I took a similar shot with my Ricoh GR with a wide angle adapter near this spot when the brook was running higher but the symmetry and accessibility of this small waterfall makes it a nice feature to shoot. Plus, the forest behind it adds a lot of depth to the scene. The Fuji X70’s articulated LCD makes a shot like this fun and easy. I continued the hike up to the top of Mt. Race which I’d not visited since last year. I was the only one on the mountain and it felt great to be up there again. That bad boy punches well above its weight Richard this is a cracking shot the detail is immense wonderful stuff and as you say that articulating screen makes such a difference. I have yet to get another look at one as yet been buying a tlr to cart on the bike slightly lighter than the blad it’s on demo so to speak. I’ve also checked out that Nikon dl 24-85 on line that looks an exceptional bit of kit, have you seen one yet Richard ? I’m very much liking the X70 Martin, it’s quite a nice camera. The two new Nikons are also very interesting. I knew nothing about them but of the two, I think the DL18-50 looks more interesting (and more expensive). I like the wider angle lens and probably would never use the 85mm of the other one. However, the 24mm end of it would be terrific, as would the 18mm end of the other one. Gad. Those two Nikons are built as direct competitors to the Sony RX100. The Fuji is a direct competitor to the Ricoh GR. I’m less into zoom lenses so even though they do look interesting, I’m sticking with the X70 as the perfect camera for me. Very nice. I never thought I’d want an articulated screen until I got a camera that had one, and now I wouldn’t want to do without. Thanks. Even if a camera has a viewfinder, having an articulated screen allows ground-level shots which add a whole other dimension to shots like this. I had an articulated LCD on early Canon G series cameras but Canon stopped using them around the time I moved away from Canon. I’m glad I’m not locked into a brand anymore although I must say, Fuji got this camera right. That is an incredible shot, Richard. I love the depth of the capture as well as the phenomenal rendering of that little water fall. Kudos. Thanks Jonne. I’m really liking the camera very much. I think much of my earlier aversion to Fuji was that I was so used to Canon’s way of doing things. Once I broke out and bought and used other cameras I felt less judgmental about new user interfaces. Still, I’m sensitive to ergonomics but as long as things work and are accessible, my old brain will make an honest attempt to learn.